BECKHOFF Automation offers Bus Terminals that enable the measurement of all relevant electrical supply network data directly in a standard, cost-effective I/O system. Gathering energy consumption data is at the core of modern building automation solutions designed for high energy efficiency. The KL6781 M-Bus master terminal extends the range of energy measurement terminals; electricity, water, gas or energy meters with M-Bus interfaces can be simply integrated in the fieldbus-independent Bus Terminal system, eliminating external M-Bus gateways altogether. Featuring a compact 12mm housing, the KL6781 M-Bus master terminal enables direct connection of up to 40 M-Bus devices, each with 1.5 mA current consumption. Additional devices can be connected by simply installing another KL6781 in the Bus Terminal node. The M-Bus master terminal converts the data from the internal terminal bus into M-Bus-compliant values with a total of 24 bytes of data per terminal available for this purpose. The TwinCAT PLC M-Bus software library, available free of charge from BECKHOFF, simplifies the integration of M-Bus devices from numerous manufacturers through predefined profiles. The M-Bus terminal extends the BECKHOFF all-in-one I/O solution with yet another useful component. With more than 400 different signal types, the BECKHOFF Bus Terminal system covers virtually all signal types encountered in building services engineering, not only supporting all common sensors and actuators, but also integrating all bus systems relevant for building services using suitable Bus Coupler types. 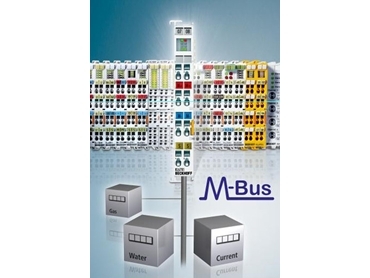 Subordinate subsystems such as KNX/EIB, LON, DALI, MP-Bus, EnOcean or serial RS232/RS485 connections such as Modbus can be integrated easily via communication Bus Terminals. In addition to building automation, the M-Bus solution can also be used in machine construction and plant engineering applications.